Some of you will have heard of Maslow’s hierarchy of needs, named for the famous US psychologist Abraham Maslow. It’s a psychological theory stating that all people have similar needs and similar priorities for them. First of all, there are the physiological needs like food and sleep. Then there is the need for safety, for belonging, for esteem and finally self-actualization, the need to improve yourself to the best of your abilities. This hierarchy of needs has almost nothing to do with today’s review. There is, however, another hierarchy of needs, one that allegedly applies to settlements. It goes like this: first you need water, then food, religion, defense, commerce and culture. Personally, I wouldn’t put religion below defense … or commerce … or 24/7 Chinese take-out, but we’re talking about the needs of a medieval city, so the hierarchy makes sense. Chinese take-out isn’t available, anyway. Let’s call this one Parks’ hierarchy of needs, for the not quite as famous but reasonably well-known game designer Andrew Parks. 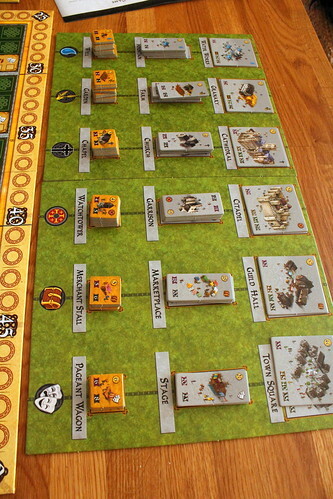 This second hierarchy gets Parks’ name because it’s at the center of his Canterbury, where you, the players, have to fulfil those needs in the 25 districts of the city to gain fame, points, money and the King’s favour which, in the end, is also points. This is the very early middle ages, when King Ethelbert of Kent decided to establish his capital in the abandoned Roman city of Durovernum Cantiacorum. Canterbury. There’s not much left of what the Romans built, only an old well in the central district. So at least there’s water in the center, that’s apparently enough for Ethelbert to pick the place, but not enough for him to move in. And that’s where you come in: you must now cater to the needs of the city, so the King can see to his need of showing off to the neighbours. Maslow missed that one, I guessed. And so you start building the city, always keeping Parks’ hierarchy in mind: each building fulfils one of the needs on that scale, but a new building can only go into a district where all the more basic needs are met. A Garden can only be built where there is a working water supply. Only when there is food and water can you think about building a Chapel or a Church. And if you tried building a Marketplace for rich merchants in a neighbourhood where people don’t have food and water… well, that would make the people unhappy, their uprising would make the king unhappy, and his displeasure would certainly make you very unhappy. Given the sorry state of your finances at the start of the game, this means that the only way to enter a new district is to build a Well there, the smallest and cheapest building supplying water. For all six services, as the game calls the needs of the city, there are three buildings that supply it. The smallest one takes one of the six spaces in a district, but supplies only that district. The medium, more expensive buildings supply their own district and the four adjacent ones. Once your money is sufficient to build those, you don’t have to start in each district by building a well. When a district gets water from somewhere else, it doesn’t need its own Well before you can build a Garden, as long as the need is met, no one really cares where the water comes from. The largest buildings, which take four spaces and are only available once for each service, are even more powerful than that, they supply their own district and up to five more anywhere on the board. Buildings and supplies don’t belong to anyone, so there’s nothing keeping your opponents from swooping into a district you supplied with some services from the outside and placing the first building there. In fact, that’s a rather common occurrence because the first player to place a building in a district scores the Breaking Ground Bonus of one point for each service available in the district. Sort of nice when someone supplied food, religion and defense already and you can take those bonus points building a measly Well. All those buildings serve a purpose for the city, of course, but their primary purpose for you is probably not hard to guess: they are all worth points. From a measly one point for the Well up to about a gazillion points – or 45, if you’re into more mundane but real numbers – for the Town Square, the large culture building. But for each building the city itself scores points as well, and while your points are obviously important in the end, it’s the cities score that you should really keep your eyes on. It controls two things in Cantebury: the game’s timing and your finances. You obviously need money to expand the city. You didn’t think anything was free, did you? As a saxon lord serving only the King, you don’t get your hands dirty to earn money, you levy taxes. Levying Funds is one of three actions you can pick on your turn. The money you get from the supply depends on the city’s score – a richer city pays more taxes – and goes from five coins at the start of the game up to 35 at the end. When you levied funds, you have to take a Full Build action on your next turn. That is, you have to place buildings as described above, one or two small or medium ones or one large one. The third possible action is for the undecided players and does a bit of both: you collect half the money you would get on Levy Funds and then build only one building. Sounds pretty useless, right? Either you take two turns to take money and build two buildings, or you take one turn to take less money and only build one building. Surely that’s the same in the end. But the difference between the two full actions and the mashed together half-and-half action is the key to playing Canterbury well, because it ties into the most important aspect of the game: timing. A lot depends on timing in this game, and the time is given by the city’s score. Not only does it tell you your income from taxation, it also triggers the two intermediate scorings at 100, 200 and 300 points and the game end one round after it reaches 300 points. And that’s where the timing aspect of the different actions comes into play. You don’t always have the luxury of spending two turns to levy funds first and build later, because later might be after the next scoring, and then it’s too late. In the intermediate scoring, points are awarded for district majorities: for each district, the player providing the most services scores one point for each space in that district covered by a building tile, the second player scores half that. And that’s why timing is so important, because being the player that triggers the intermediate scoring allows you to make some last minute adjustments to the majorities just before the count. Compared to that, taking a turn right after the scoring is not very attractive. You have a lot of control over the speed of the game, using it well is how you win. The final scoring repeats the district majority scoring once more, but it also scores the King’s Bonus. For each of the six services, the player that provided it to the most districts scores a nice chunk of points, second in line scores a smaller chunk, both scores coming from a table that is adjusted every time someone provides a new service to the district. 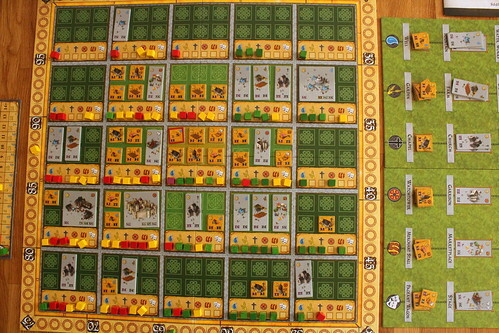 The King’s Bonus table is my one complaint about the otherwise great components of the game: on a board slightly bigger than an A4 piece of paper you have six scales, each with one counter cube per player. It’s almost impossible to adjust this thing without nudging some other cubes to places where they are not supposed to go, at least for me with my ring size 10 fingers. But I can ignore the fiddliness for the nice score boost at the end of the game. 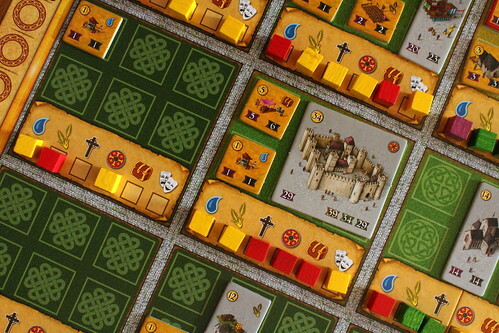 Canterbury is an elaborate majority game where you score points for balancing the different majorities well. District bonuses are nice, the king’s bonuses are nice, if you can figure out the right move to advance in both, you’re on the way to victory. It’s not the first game where you juggle different majorities to win, but it’s a well made one with a good balance, and the strong element of timing improves it. Also, there is a good amount of interaction here, you have many ways to profit from what your opponents are doing and should always watch what they can do on their turn as well. There is only one thing that doesn’t work out quite as intended, the first player always seems to have a harder time than everyone else. We’re not exactly sure why, and it’s not so bad that the first player can’t win, but a few of our testers said that they struggled more as the first player. But despite that, I’m always willing to play more Canterbury. Even as the first player. And what does all that have to do with Maslow? Well, Canterbury endangers you on multiple levels there. You’re not in any physiological danger, you will still get food, sleep and all that other stuff. But there’s no guarantee for your safety or sense of belonging, because you can get friends pretty angry in this game. On the other hand, your esteem may suffer from their actions, and I really didn’t feel well about my self-actualization when I didn’t win against the same people, no matter how often I tried. So, four out of five ruined. But the need for a good time while playing that Maslow overlooked in his hierarchy is satisfied. The stuff of bad science fiction movies, come to live. That’s what you get in Science Fiction Double Feature, the third expansion to Smash Up. And they are all here to fight over the world, be it with bananas or martinis. The problems with building pyramids don’t start with stacking big stones on top of other big stones. Sure, that’s one problem, but when you get to that point you solved a couple of other things already. Like how to get big stones when all you see around is sand. That part of the operation is the focus of Phil Walker-Harding’s Imhotep: get stones from the quarries down the Nile and to the construction sites, on ships you have to share with other architects working on the same project. Everywhere you look lately, the news are about the economy. It’s boring , like a roller coaster you’re not allowed to ride. Masters of Commerce allows you to experience the same roller coaster, but instead of finding a bridge when you lost everything, you can have fun going bankrupt. Long, deep and historical games are not uncommon, but they usually focus on war. Sigismundus Augustus goes a different route, it’s all about Polish Politics under the King with the game’s name. A completely different type of challenge, but just as tricky to win. But how much fun is history without bloodshed? Crows is a game about crows. And shiny objects. It’s a game that has crow meeple, and many chances to screw your opponents out of points they thought were safe already. 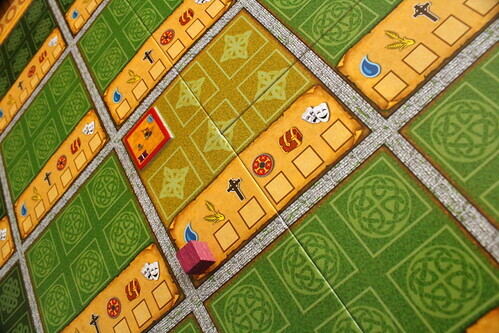 It’s also a game that has crow meeple, did I mention that? A huge Empire without a permanent capital is something that is hard to imagine today. But in medieval Europe, the Staufer emperors had their itinerant court, they would travel around their empire and rule from wherever they just happened to be. That way, everywhere in the empire could have the glory of hosting the emperor, and he would get first hand knowledge of what was going on everywhere. In The Staufer Dynasty, you are a member of the court of Henry VI, working hard to get members of your family into influential offices all over the empire. Expensive game components, the final frontier for board game publisher. These are the games of Victory Point Games. Their continuing mission: to bring you new games, to seek out new authors, new genres, to boldly ship their games in a ziploc bag. You guessed it, Final Frontier is a science fiction game that keeps referencing a certain TV series. But is a good theme and paper components in a ziploc game enough to make a great game?